This event is open ONLY to APA Associate and Professional level members, so take advantage of this member benefit just for you! 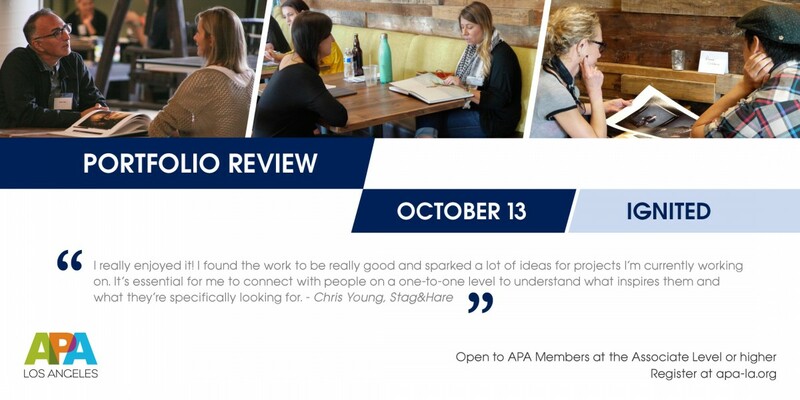 APA Los Angeles holds these reviews twice a year to provide constructive feedback to member’s portfolios and/or websites. Members get expert personalized reviews from top industry professionals: art buyers, photo editors, fine art dealers, curators, gallery owners, in-house creatives and entertainment companies. These are folks on the front lines of hiring photographers and they know branding, marketing, and editing. Sign up today to meet these elite reviewers! After you have registered instructions will be sent and reviewer choices will be selected - please note requested reviewers are not guaranteed. Attendees will be responsible for parking. APA members at the Supporter level and above receive an 30% percent discount.